3. URL of spoof website disguised as https://onlinebanking.huntington.com/security/login.asp. This looks secure (https) but is NOT! 4. 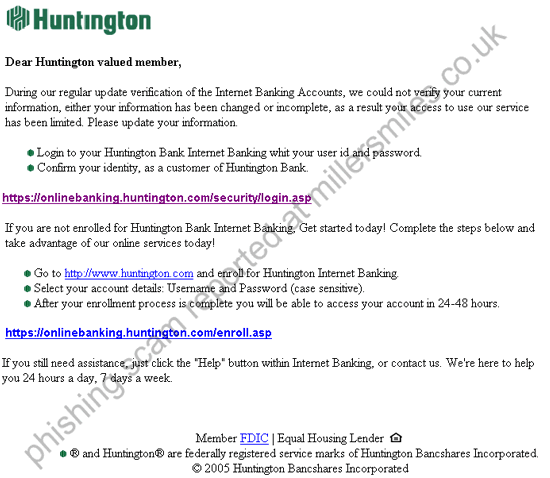 Real URL looks similar to the genuine Huntington Bank URL - do not be fooled! 5. Website traced to Berlin, Germany.
" During our regular update verification of the Internet Banking Accounts, we could not verify your current information, either your information has been changed or incomplete, as a result your access to use our service has been limited. "